David was a farmer’s son in Bethlehem. He lived in a white, flat-roofed farm-house with his father Jesse, and his seven older brothers. 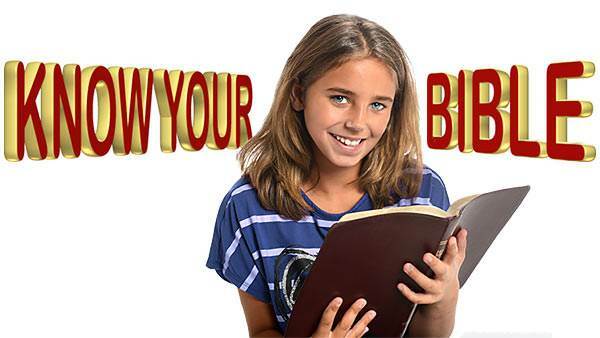 When David was big enough, Jesse set him to watch the sheep and the little lambs. 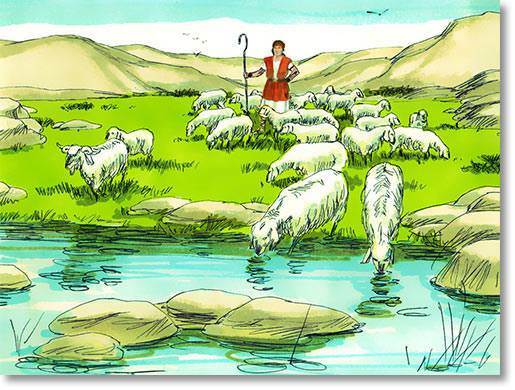 David was very strong and very brave, and he loved every sheep and every lamb in his father’s flock. He knew just where the greenest grass grew, and where the freshest water could be found. 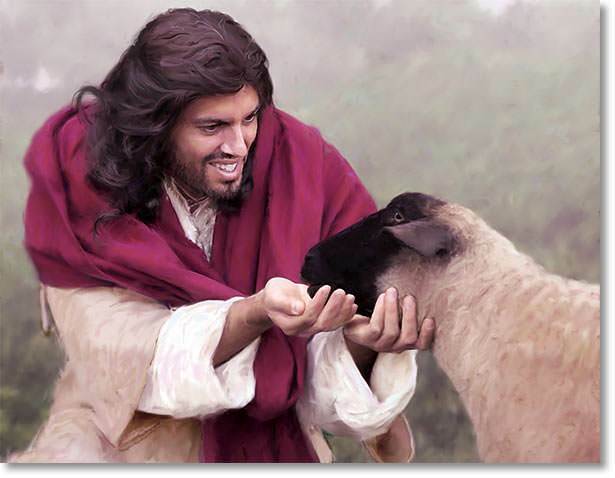 He never left his sheep without someone to care for them. 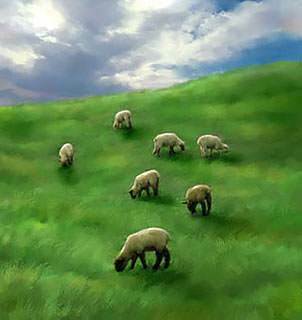 He knew their names, and when they sought fresh pasture, he went in front to lead them. He would call their names so lovingly if they started to wander off. If a little lamb was tired, he would carry it on his shoulders, or in the big pocket in front of his shepherd’s cloak. 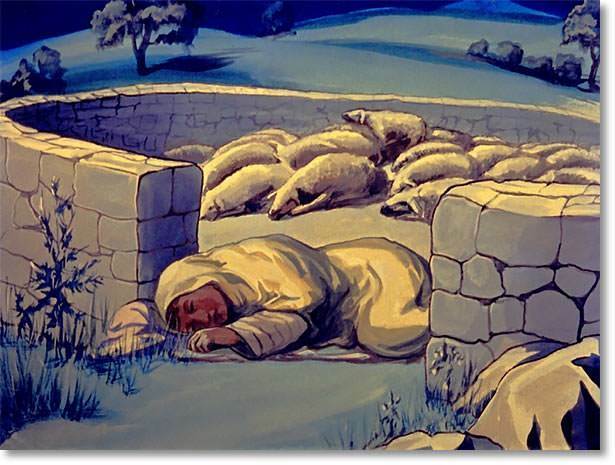 At night he would lead all the sheep into the sheepfold, where they would be safe for the night. Then he would light a fire and watch out for thieves or wild beasts coming to steal away one of the sheep. David had a sling which he carried at his belt, and a bag in which he kept smooth, round stones. Sometimes a lion came to try to steal a lamb, and sometimes a bear. Whenever a lion or bear came near, David would take a stone from his bag, fix it in the sling, and shoot, whiz! Bang! The stone would hit the wild beast’s forehead, and over the animal would go. 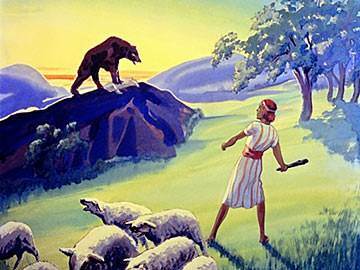 Then David would hurry up, and, taking his club, would soon kill the animal. And the sheep and lambs were always safe in David’s care. 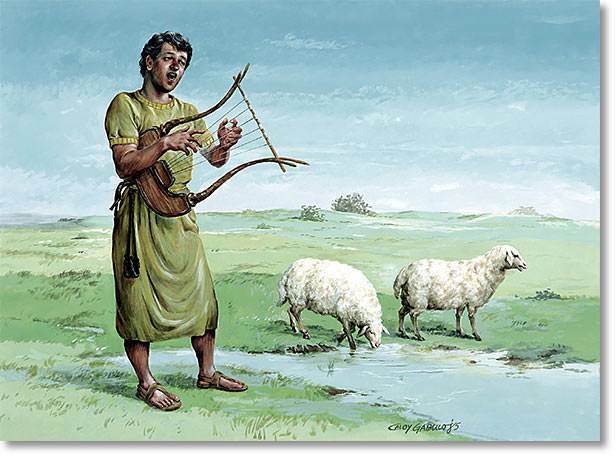 Sometimes in the daytime, when the sheep were quietly feeding, David would play a tune and sing. He had a harp with which he made sweet music. 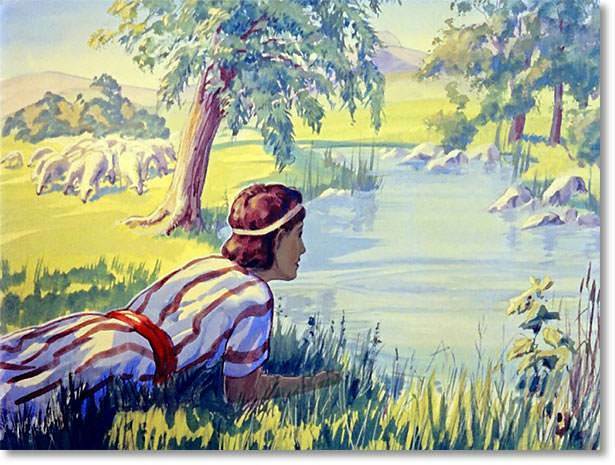 David could hear a song in the sound of the brook, the whispering leaves and long grasses. He picked up his harp which lay beside him, and began to play—he copied the soft whispering music of the wind in the oak leaves, the merry sound of the running water, the song of the birds in the branches. All the lovely thoughts in David’s mind came into the music. This is what he sang—a song of God, the Shepherd of His sheep.